West Roxbury, Mass.-- When Ms. Margot Carlson Delogne and her sister Ms. Kim Carlson Benner posed for a photograph with their father in May of 1966, they did not realize it was the last photo they would take with him. Mr. John Carlson, their father and a captain in the United States Air Force, deployed for Vietnam moments after the photograph was taken. He was killed in action six months later. “I grew up hating everything Vietnamese. I had no sense that there was another side to this war,” Margot told a group of juniors and seniors in Mr. Vincent Bradley’s American War in Vietnam class at Catholic Memorial School. 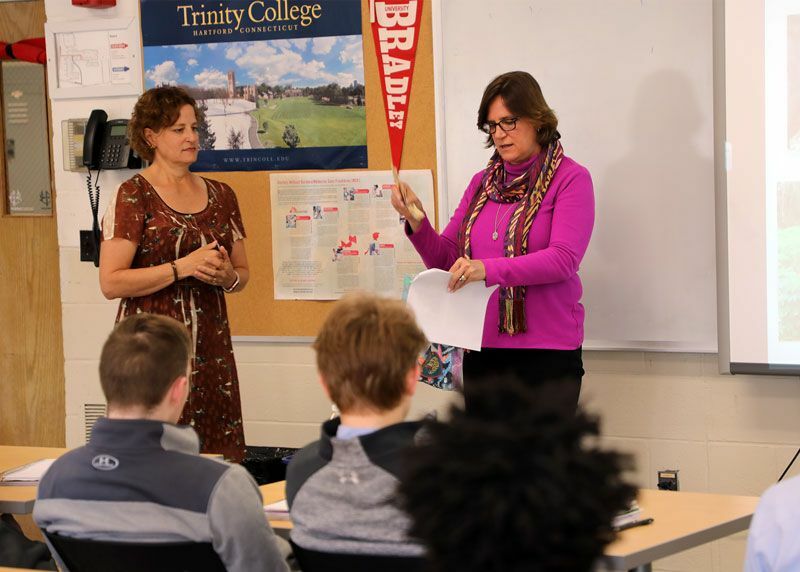 Delogne and Benner visited Mr. Bradley’s class on Tuesday to discuss the work of the 2 Sides Project, the non-profit Delogne founded which unites sons and daughters who lost fathers on opposite sides of the Vietnam War. During her childhood, Delogne focused on the loss of her father and her grief. But she had an epiphany as an adult. While driving to work one day, she heard a story on NPR that highlighted how two groups with competing interests came together to avoid a plant closure. While not directly related to her father or Vietnam, this story led her to a realization. She was not the only one who lost a father. The 2 Sides Project took shape soon after. “There are always two sides to every story and there are two sides or more to every war. I think it is important that once the conflict is resolved to share experiences so that people on both sides can heal. The best way to do that is to connect one-on-one,” said Delogne. During their visit, Delogne and Benner took turns sharing stories of their childhood, the work of their non-profit, and highlights of their trip to Vietnam to meet the sons and daughters on the opposite side. Their story was personal, honest, and poignant. “I was terrified. They might be really, really angry. That melted away when you met someone who went through the same life experience as you,” Delogne shared as she described the moments leading up to the initial meeting. The pair also showed film clips from the award-winning documentary that chronicled their trip to Vietnam. The documentary has been featured on PBS. They also showed artifacts from the trip including rocks from the site where their father’s plane crashed. “I think any time people get to hear a personal story rather than reading a history book it is easier to relate to. I think the sooner people can hear these stories before they embark on adulthood, it helps them be a little more compassionate and understand the complexities of life,” said Benner describing the importance of presenting the non-profit’s work to students. Students listened intently to the pair’s words as well as those interviewed in the documentary. Following the presentation, students’ hands shot up when Delogne and Benner asked for questions. “In all honesty Mr. Bradley has done a great job [teaching the course], but when you actually hear someone speak about it, you have a lot more respect for what happened. The amount of courage it took for two daughters to go over there is amazing,” said senior Khari Johnson. The conversation did not stop when the bell rang to end class. Students stayed to thank Delogne and Benner for their visit and to ask their remaining questions. The visit is part of a broader initiative among the History and Social Studies Department to make learning history active, relevant, and applicable to students’ lives. The department regularly invites history scholars from the nation’s best universities to speak with students and utilizes the city of Boston by incorporating visits to the Edward M. Kennedy Institute for the US Senate, African Meeting House, and Massachusetts Historical Society. The Vietnam course is a semester elective in the History and Social Studies Department. This is the third year that the course has been offered. It is one of 31 new courses that have been added over the last four years in all academic departments.